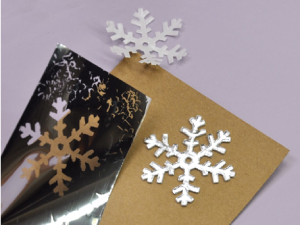 This tutorial shows how to "Wear Your Adhesive on the Outside" by using craft foil. 1) Remove liner paper from Designer Shape. 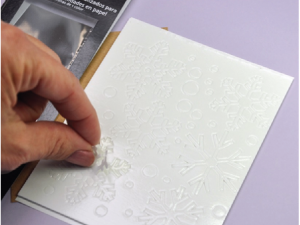 Here we are using 3D Foam Snowflakes, but you can use any of our adhesives. 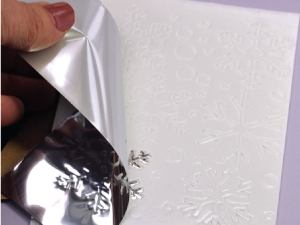 2) Gently rub craft foil onto exposed adhesive, with the shiny side of the foil facing up. 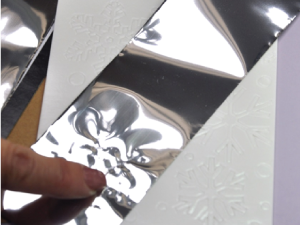 3) Pull foil from adhesive. You may need to fill in some areas, just repeat with colored foil contacting exposed adhesive until covered. 4) Remove Designer Shape from sheet, carefully lifting the detailed areas, align onto project and adhere.